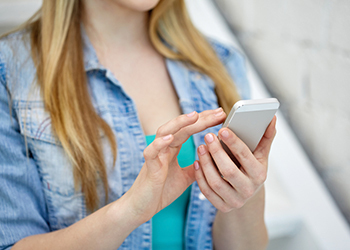 Although cell phones allow individuals to have unlimited access to information and to connect with others in a way otherwise thought impossible, there are many harmful and disturbing effects of smartphone dependence. Cell phone addiction, sometimes referred to as problematic mobile phone use, is a behavioral addiction thought to be similar to that of an Internet, gambling, shopping, or video game addiction and leads to severe impairment or distress in one’s life. A preoccupation with material objects as opposed to intellectual, spiritual, or cultural values. Cell phones have become a representation of social status and thus, there is pressure to own the newest release and to have all of the best applications. People suffering from this condition oftentimes have what has been coined “nomophobia,” or the fear of being without one’s cell phone. With the widespread accessibility of cell phones at a younger age now, teenagers are especially prone to developing an addiction to their cell phones or social media. Whether you or a loved one suffers from a cell phone addiction, there is hope for recovery. Failed attempts to cut back on smartphone use. Loses track of time when using mobile phone. Uses cell phone in order to deal with unwanted emotions. 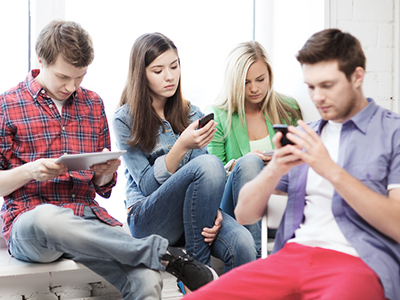 Teens are extremely vulnerable to developing a cell phone addiction. The human brain isn’t fully developed until about 25 years of age. Adolescents who become dependent on their smartphones could experience negative alterations in brain development. Problems in the parts of the brain that are responsible for decision-making, impulse-control, and emotional regulation. Teens with a smartphone addiction are more likely to drink alcohol, use tobacco, and have poor diets. If you’re concerned about your teen’s problematic cell phone use, there are many different treatment options available. Call the number above to speak to a treatment specialist immediately. If you’ve been upset or frustrated by your loved one’s excessive phone use while in your presence, you are not alone. Appears anxious when phone battery is low. Panics if cell phone is misplaced or service is unavailable. Spends more time connecting online than connecting with people in real life. Sleeps with the smartphone on or under the pillow. Uses the phone in dangerous situations such as driving. Has his or her smartphone on the table during meals. Believes the cell phone to have rung or vibrated when it hasn’t. This is not a complete list of signs and symptoms but it includes some of the common signs that a loved one may be suffering from a smartphone addiction. If you worry that your loved one’s cell phone use is problematic, don’t hesitate to call the number above to learn about recovery options. There are various types of treatment for those with a cell phone addiction. This could be as simple as making rules for yourself and downloading apps on your phone to cut down usage. Or, for more severe cases, there are different therapy methods and treatment centers available.